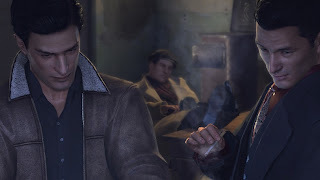 I have to admit, I’m one of those that felt I couldn’t get into the first rendition of the Mafia series because it just seemed overwhelming and appeared more geared to the PC crowd in design. But Mafia II, since the first trailer dropped sometime in early ’08 had me following this title every step of the way to date. In this On The Horizon segment I bring to you Mafia II as a gamer and non-PC gamers alike need to keep an eye on. It’s scheduled to be released sometime in Spring 2010. The story so far is you’re Vito, an Italian-American trying to do what’s right, well sort off from a crime family’s point of view [grin]. Set in the 1940s this it’s reported to have an all new game engine allowing free roaming and some pretty hot shoot out missions ala Gears. Check out some in-game footage, and be sure to pick this bad boy up come 2010!